We welcome the report of the High Commissioner for human rights and we highlight the attention he gives to the plight of migrants. Migrants often find themselves outside their own country for the purpose of seeking protection from the gravest forms of persecution and other types of harm that have caused them to flee. People fleeing from harm that is perpetrated by State and non-State actors, or even as a result of natural disasters deserve to be protected. The failure of a destination State to provide this protection constitutes a serious violation of international law. If States cannot protect the human rights fulfilment of those who are fleeing, they are then not able to answer the call that international human rights make upon them, thereby sliding below the minimum level of treating each other humanely. Many Member States of this Council were built from the work and suffering of migrants, even sometimes from those who were forcefully brought to their country. 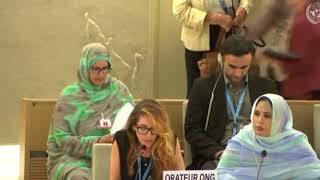 International Lawyers.org and Geneva International Centre for Justice hold that this Council must take actions condemning those that refused to provide protection to migrants who are fleeing from persecution and other forms of harm, and that it must have the courage to make an unequivocal statement in support of the human rights of migrants.